Rome, Berlin, misdirection, a duplicitous new Mossad director, "sweet cheeks" and a car crash. I'm not sure we could ask for much more from such an enticing NCIS episode as "Berlin." The hour opened with Mossad agent Amir Mantel waiting for a contact in a parking garage. A car pulled up and someone he recognized rolled down the window and shot him. Abby later figured out that the communication earpiece he was wearing wasn't from the latest Mossad equipment, so Mantel could not have been working (or at least wasn't communicating) with Mossad at all, despite Mossad Director's assertion that he was, and that a member of a rogue faction from within Mossad had done the shooting. At the end of the episode we still weren't sure what that was all about. The Tony/Ziva tease brought us much closer to what so many were hoping to see, but not yet all the way. We're not done with NCIS season 10, though, and so we're left hoping for more - providing everyone's okay after that final scene. Ziva: You know I keep thinking if it was not for Orli, things would have been different. I would be a different person. So rude of that assassin to smash into them just when they were holding hands and starting to get into it. It made me wonder: was that Bodnar trying to do away with Ziva? He knows her and is aware of her tenacity. He had to know she'd never give up trying to hunt him. I'm surprised she didn't roll her eyes when he advised her via video-link to let it go: please forgive me and walk away. Vendettas lead to nothing but heartache. Interesting, too, that he told her that there was more to the story - and that nothing was at it seemed. Food for thought there: was he actually trying to justify his killing of Eli? Or perhaps it wasn't him at all who killed him and there was no attempted coup? What's the real story here? We now know that the supposedly rogue faction of Mossad that Director Orli Elbaz spoke about was a lie and that the supposed rogues were all valid agents still in good standing with Mossad. We also know that Director Elbaz wanted NCIS and the other U.S. agencies to spin their wheels looking for Bodnar in every place other than where he was: the U.S. The questions keep piling up, and there's no real light being shed here. That last question seemed rather pointed, suggesting that perhaps in addition to killing that reporter, Eli David had done something else wrong, something worthy of his own death. Or at least it leaves the question open. At the end of the day, Vance decided to let Mossad off of the hook with their misinformation, all in an effort to ensure there was no further wasted effort in the hunt for Bodnar. Ziva's back story with her father is worth talking about as well.So many of her choices were based upon the events of her family life: her father constantly going out on "business trips;" the breakup of her parents' marriage, as a direct result of Eli's indiscretions with a young Orli Elbaz (no wonder Ziva hates her! 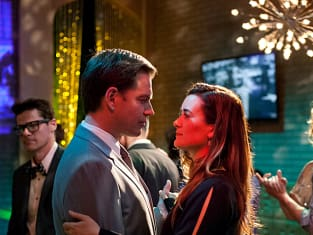 ); Ziva dancing with her father as he says: My Ziva. One day you will dance with a man who deserves your love. So touching to watch that scene as she remembered it while dancing with Tony. You get the sense too that Tony's new pet nickname for her will now be "sweet cheeks": after calling her that in the hotel room, she laughed and said she remembered the first time he referred to her that way. It seems he called her that in season three, episode eight - though I don't know the circumstances. She didn't like it back then but this time, it was different: he called her that again on the dance floor. In season three, I think she saw it as derogatory, but this time it was a term of endearment. There's no doubt that these two are going places. Marina Sirtis fits the Director Elbaz role well: I expected to see a slightly older version of Deanna Troi but instead encountered someone who fully took on the Mossad director character. Entirely believable and engaging. Ben Morrison embodied the young Eli David role well, too, right down to his mannerisms and voice. That was some great work, both with his acting and the costuming. Ziva seems to think that Director Elbaz's duplicity involving Bodnar's location has to do with the love she had for Ziva's father - and that she shared the same motivation as Ziva: to hunt and kill Bodnar without interference from government agencies. I'm not so sure - nothing with this woman is at seems. Check out this week's NCIS quotes. This week's NCIS Round Table discussion is up! Come over and add your take on our discussion. Now it's your turn: Is Bodnar's suggestion that Ziva's seeing the whole thing in the wrong light accurate or is he just trying to save himself from her? Was he behind the crash - or was that the work of Director Elbaz? Or someone else? What key piece of information have we missed here? Is there anything that can help us figure out exactly who Amir Mantel was and why he was killed? 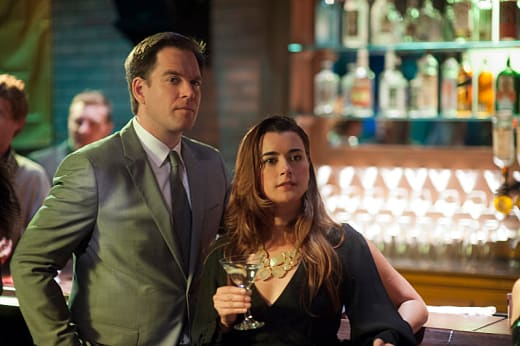 And finally - what's going to happen with Ziva and Tony? Will this budding romance go into the next season with them?